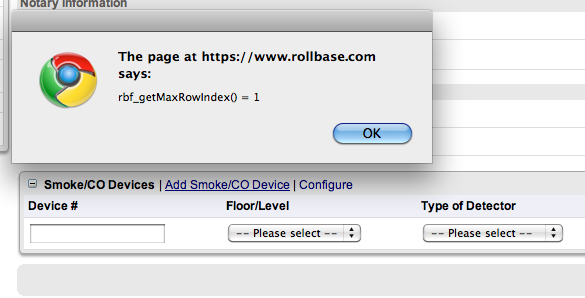 Home » Community Groups » Rollbase » Forum » rbf_getMaxRowIndex() equals 1 more than it should be. 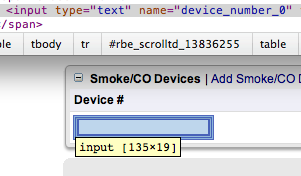 rbf_getMaxRowIndex() equals 1 more than it should be. rbf_getMaxRowIndex() equals 1 more than it should be. After adding the first row to the grid, the row index should be 0, but rbf_getMaxRowIndex() is returning 1. Field name is: "device_number_0" since it's the first row that is created, but rbf_getMaxRowIndex() is returning 1 after this first row is added. This API returns maximum value for rowIndex in grid..."
Maybe this should be changed to "returns one more than the maximum"? but it was not working because rowIdx was always 1 more than the actual row index in the grid. In other words, it was trying to update fieldname_1 when there was only fieldname_0 in the grid. I can always do var rowIdx = rbf_getMaxRowIndex() - 1. I just wanted to be sure it's correct, though.